Robert walked through the streets of the city he took in the sights. He had just moved here, and he already was out looking for a place to get books. As he wandered the streets looking for a book store he was drawn to the many sights there were. Soon afterwards he found himself not looking for a bookstore, but instead going anywhere and everywhere that seemed interesting. Robert was fascinated by the new sights, this city was a quite different from Munich. However just as he was about to continue on Kurt stopped him in his tracks. Robert looked around, realizing that in wandering around the city he had gotten himself lost. Robert cursed himself, he always had a knack for letting his curiosity run wild. He guessed this was what he got for letting it get the best of him again. He looked around, hoping to get a grasp of where he was. He couldn't see any familiar sights, but did see a park nearby. "I don't know." said Robert "Let's head to that park over there, maybe we'll find a map of the general area." Kurt silently agreed and the two of them headed there. Once he arrived he looked around, not knowing what to do. There didn't seem to be a map nearby, but maybe he could ask around and get some clues to where he was. Apparently, Kurt had the same idea, because soon afterwards Kurt pointed to someone. Robert walked up to the person, not really paying attention to their appearance of anything like that. "Excuse me," started Robert "Would you happen to know where this place is?" Sanae turned around when she heard someone speak to her. She smiled up at the boy. "This is the park!" she answered cheerfully. She looked at him in confusion, wondering why he wouldn't know. Then, it suddenly made sense to her. "You're not from around here, are you?" Tomo peeked her head out of Sanae's bag. "Sanae, who are you talking to?" She glanced at Robert, then at Kurt. "Hm." Etsu wiggled her way up next to Tomo, pushing to other Chara aside in the process. "Tomo, who is it? Do we know th--" She broke off with a loud gasp. "Another Chara!" she exclaimed, flying out of the bag in excitement. She floated over to Kurt, a wide grin on her face. "Hi there!" The answer Robert got from the person in front of him was a little helpful. In his head he tried to remember all the parks he could think of in the area. It was a good thing that he had taken a good look at a city map before leaving, though now he felt like he probably should've brought the map with him. Based on what he remembered from the map he thought he knew where he was, but he wasn't completely sure. If Robert had been paying more attention to landmarks he probably wouldn't be in this situation, but he was too distracted by the new sights. "Thank you" replied Robert. It was only a moment later where the person guessed, quite accurately, that Robert wasn't from here. "Yes, I just arrived from Germany." Then Robert saw something he wasn't expecting. Out of this persons bag popped out not one, but two Guardian Characters. One of the two seemed to take in the situation calmly, much like how Kurt would, while the other jumped out and raced straight towards Kurt. Kurt was caught off-guard by the sudden appearance of these Guardian characters. He had felt them nearby, but just didn't expect them to come out at that moment. That and he didn't expect the other one to come flying out of the bag. He took a moment to collect himself before responding. "Hello, nice to meet you." he started "I suppose some introductions are in order. I'm Kurt." Robert caught Kurt's drift. "You're right Kurt." he said "I'm Robert Alberti. Who are you?" Kyo walked into the park with a group of other people, moving to the small area of grass on the far side of the park she stood amongst the crowd. "Alright guys you remember the routine from last week right?" A petite lady stands at the front of the group a small radio on the ground beside her. There are various responses of yes throughout the group. Mizu looks around she could sense another chara..."Kyo-san I sense a chara"
Kyo looks at Mizu she couldn't talk to her here in the crowd she would look weird but her eyes scan the park looking for who might be the source. 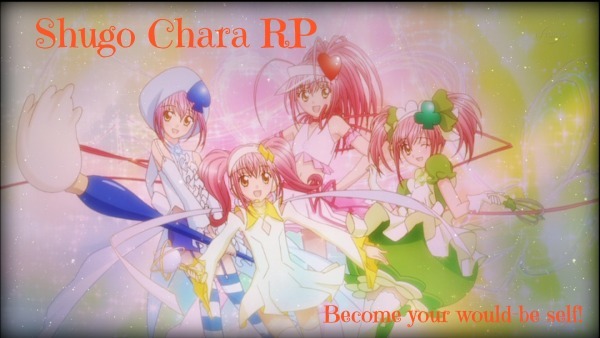 There had being a large increase in the number of chara's around for a while now. Kyo's eyes land on Sanae and Robert on the other side of the park and she watches them from her spot, she knew Sanae was guardian and had a chara but Robert was to old to be one. "Get to your places" the instructor calls out. Kyo moves to stand in her usual place. Either way it didn't matter she wasn't here for Easter she was here for her dance class. "Wow! Germany! That must have been cool," Sanae marvelled. "Ah, yes! Introductions. My name is Matsumoto Sanae, and it's nice to meet you." "I'm Etsu! I knew I felt another Chara's presence, and it was you! How exciting!" Tomo crossed her arms. "We're not the only Charas here. I feel another presence." Robert never understood why some people thought Germany was cool. From the perspective of someone who had lived in Germany it wasn't a special place. Pushing that thought to the back of his mind, he listened to each one of them introduce themselves. Then, Robert spoke. "It's nice to meet you all." said Robert. "Yes, nice to meet you." chimed in Kurt. Only a moment later Tomo said she felt another presence. Kurt could feel it too. "Odd, Robert doesn't have any other shugo chara's." he said "Maybe there's someone else with a shugo chara nearby." Rober then took a quick look at Tomo. There was one particular detail about Tomo that had caught his eye, and he hadn't asked about it. He knew what her name was now, so now was as good of a time as any to ask. "Say Tomo, this is a bit unrelated, but that deerstalker of yours, it wouldn't happen have anything to do with Sherlock Holmes would it?" "Sanae doesn't have any other Charas either," Etsu said. "Maybe it's one of our friends! That would be exciting!" When Robert asked about her deerstalker, Tomo smirked proudly and put her hands on her hips. "Why, yes. Yes it does. It's about time somebody understood. Everyone just asks me about my 'funny hat,' not understanding that such a hat is worn to signify a detective of the highest caliber. That being said, a hat such as this one should only be worn by a worthy detective such as myself. Anyone else that wears it would tarnish its image of great intelligence and power. And that would simply be a crime." Sanae smiled at her Chara. Tomo always got so excited when she was given the chance to speak in depth about something. Sometimes she gets a little carried away and rambles. Kurt nodded after Etsu said that the other chara they were sensing might be one of their friends. "Yeah, that would be nice." he said. Robert listened as Tomo went on about how her hat was a sign of a high caliber detective. He couldn't help but smile when he heard the mention of a detective. Who would've guessed that he would run into another detective shugo chara here. Robert looked at Kurt. "Hey Kurt, it seems like there's another detective here." Kurt had also been listening to what Tomo was saying. It was very interesting to say the least. "It seems like there is." replied Kurt. "It's nice to see fellow detective." Kurt had to smile too, it wasn't every day which he met another detective character. "Another?" Sanae repeated in confusion, tilting her head to the side. "Ah, I see," Tomo said. "Robert's dream is similar to Sanae's, I presume? Most likely not the same, as Sanae's dream was simply to become more like Sherlock Holmes, which in turn makes her more like a detective." Sanae covered her cheeks as she blushed, slightly embarrassed of her dream. "Tomo, sometimes you talk too much. And that's not the only reason you were born." Tomo put her thumb and index finger to her chin and nodded. "Yes, yes. Yes, indeed you are right. The wish to become more observant." "Speaking of observing," Etsu cut in, "can we do some observing and find out who this other Chara is? I want to see if it's a friend of ours!" Kyo continued through the routine paying little attention to what she was doing. "Hey watch it!" She had just stepped on someone. "Ah sorry" Kyo says moving away from the boy she had just stepped on and to the back of the group. "You are so easily distracted" Mizu says following Kyo to the back. "You insist upon these ungraceful dancing classes yet you cannot even pay attention!" Kyo was watching the two other Chara bearers again. Mizu lets out a sigh "And she is gone again"
For a while Robert thought that Sanae was right when she said that their dreams might be similar. It was a possibility, but he knew that just because both of their shugo chara's were detectives that didn't mean that their dreams were the same. This was confirmed by Tomo only a moment later when she said that Sanae wanted to become more observant. "Interesting, Robert's dream is to become a detective." said Kurt "He has a strong desire to stop criminals and protect the innocent." Robert chuckled when Etsu said that she wanted to find this other chara. "Alright." he said, smiling "I have to admit, I'm a bit curious myself." ( Ah good point ^^"
"Stop criminals and protect the innocent, eh?" Sanae repeated, a smile on her face. "You'd make a good Guardian! Though you're a bit old to be one..."
"Enough chatting! Let's investigate!" Etsu cheered. "Ah, my dear Watson! I love your determination," Tomo approved. "Let's get going." "If you guys insist. Lead the way." Etsu and Tomo led the way towards the Chara they sensed. The dance class was just finishing up when Mizu comes over to Kyo " The other chara bearers are coming over " Mizu informs Kyo as she takes the chance to grab a drink from her water bottle. Kyo looks around her eyes resting on the approaching Guardian and the other character bearer and shrugs at Mizu. " If they don't pick a fight with me I won't pick one with them"
Sanae's mention of "the Guardians" piqued Robert interest, but before Robert could ask about it Etsu and Tomo were already leading the way to where Robert assumed the other chara was located. Kurt seemed to follow closely as well. Oh well, Robert would just ask while they're walking. "So, Matsumoto-san" Robert started "What are "the Guardians"?" Sanae thought for a moment. "Hm... it's like a club of sorts. We're like the student council of our school, Seiyo Elementary. We stop bad guys from hurting the eggs of children's hearts. We're like... the Guardians of hearts! I'm the Queen, actually." The answer that Robert heard only intrigued him even more. The Guardians were a group of people who stopped people from hurting people's hearts? Perhaps in some respects they were similar to his group. "Sounds a bit like Weiße Rose." It seemed Kurt had caught on to the similarities too. "Sure does Kurt." replied Robert. He then looked around again, wondering where they were heading. "So, where is this chara that you guys feel is nearby?" Kyo walks over to Robert and Sanae, Mizu hovering casually by the left side of her head. " I think that would be me " she says sizing both of them up a slight smile hovering on her face.